← “Fiddle Fern” Checks in From Vermont! First piece of new mosaic challenge! So, I’ve been slacking in the posting-new-work department lately. I admit it. Life’s been a little chaotic and I only recently just got back into my studio and started making art. I’ve missed it. I can admit that. Whether I grout each week or all at once, the challenge is on! To get started on the the right foot, here’s my first piece, in process. Working title: Mermaid. Something better to come soon, I’m sure. 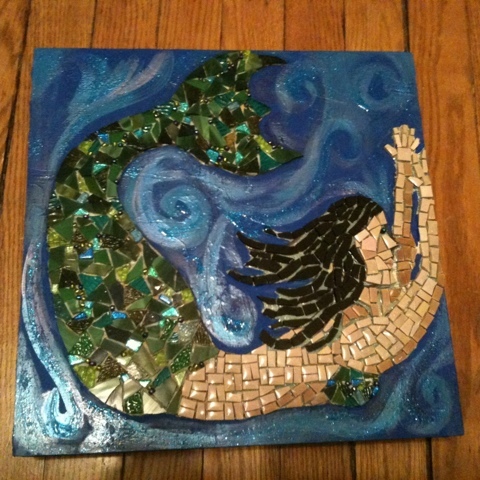 This entry was posted in Mosaic Musings, Work in Progress and tagged mermaid. Bookmark the permalink. 1 Response to First piece of new mosaic challenge! Next step is the mosaic glass over the water areas and then grout! Watch for updates soon!